Though the crocodile’s ancestry dates back 200 million years, the crocodile, as we know it today, first evolved about 80 million years ago. According to the fossil record, their body plan has changed little since, enabling them to outlive the dinosaurs and become the most advanced of all reptiles and the most successful freshwater predator. There is no single secret to the crocodile’s success. With few natural predators, a permanent armor of bony plates covering most of its body and strong jaw muscles capable of crushing anything from bones to cast iron, the croc is an extremely tough and robust creature. A croc can survive even after serious injuries such as a torn off limbs or tail and has a powerful immune system that helps it survive for decades. But its adaptations go beyond being hardy. One of the keys to its survival is something one might think of as primitive: cold-bloodedness. Like all reptiles, crocs are ectotherms, which means they must gather heat from their environment. Crocodiles have developed behaviors to control their body thermostat: they bask in the sun when cool and seek shade or water when hot. Ectotherms like crocs don’t need to eat regularly to warm their bodies, and so they save an enormous amount of energy that can be put to other use or stored for later. A croc’s metabolism is so evolved that its body uses and stores nearly the entirety of the food it consumes. This is one reason why larger crocodiles can go for over a year without eating a meal. In extreme situations, crocodiles appear to be able to shut down and live off their own tissue for a long period of time. But most crocs eat much more often than that. In fact, the average croc eats about 50 full meals a year. When they feast, crocodiles are certainly not picky eaters. 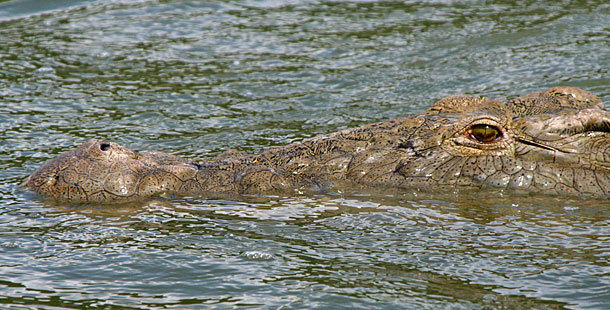 It’s said that a croc will feed on anything it can outswim or ambush and overpower. These reptiles have extraordinarily adaptable diets. Larger crocodiles will eat larger mammals and birds, but they’ll also eat fish and mollusks like snails. During difficult times, they will even scavenge for carrion. In fact, crocs will consume almost everything they encounter. And that means everything. A croc’s stomach is the most acidic of all vertebrates, allowing it to digest bones, horns, hooves, or shells. Nothing gets left behind in a crocodile’s dinner. In fact these hard objects are used as “gizzard stones” in the croc’s stomach to help grind coarse food. While the crocodile’s diet may be undiscriminating, its social interactions are a bit more complicated. Crocs are more social than all other reptiles. Though they primarily lead solitary lives, they resort to group behavior for important activities such as hunting or raising hatchlings. Crocs don’t merely recognize one other, they form long-term relationships. They are hierarchical and communicate by means of vocalization, postures, chemical signals, even touch. A crocodile’s brain is more complex than that of any other reptile. These powerful predators also have an excellent sense of smell and superior sound perception. Noting the crocís ability to learn to avoid dangerous situations, researchers have found that they have to modify their techniques when capturing crocs. It’s very hard to catch a croc twice with the same trick. Crocodiles have demonstrated behavioral, physiological and structural adaptations that have allowed them to thrive for hundreds of millions of years, but, unfortunately, surviving human encroachment may be their biggest challenge ever. Through habitat enhancement and environmental education, humans may be able to ensure that these once endangered prehistoric reptiles practice their sophisticated survival skills for years to come.